The JAZZ ENSEMBLE is a jazz based ensemble performing advanced arrangements of contemporary popular music in various styles. Dr. Utah Hamrick frequently performs with Austin-based composer Graham Reynolds, including motion picture soundtracks for Bernie and All is Bright. He has performed with jazz luminaries such as Houston Person, Byron Stripling, Larry Ham, Bill Watrous, and Tommy Igoe, and performed with Willie Nelson for the opening of the ACL Live Moody Theater. 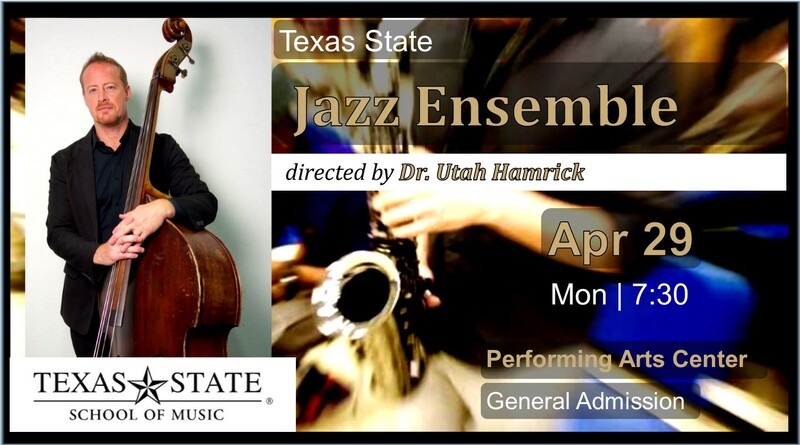 Prior to coming to Texas State in 2015, Dr. Hamrick taught at the University of Texas at San Antonio for ten years, where he directed the jazz ensemble and combos and taught jazz history and improvisation. Under his direction, the jazz ensemble received numerous recognitions, including Outstanding Collegiate Band at the Sam Houston State Jazz Festival, straight I-ratings at the University of Northern Colorado Jazz Festival, and an invitation to perform at the 2016 TMEA conference. Special Event Parking for all fine arts events occurring in Theatre Center and Performing Arts Center is now only available in the Edward Gary Street Garage located on the corner of University Drive and Edward Gary Street.